Last Chance to Be Koalafied! – microBEnet: the microbiology of the Built Environment network. home Uncategorized Last Chance to Be Koalafied! My name is Katie Dahlhausen and I am A PhD student in Jonathan’s lab. I am crowd-funding a project to study this fascinating koala biology, as well as investigate alternative infectious disease treatment where antibiotics are not a viable option. Want to help out these adorable critters? You can support the Indiegogo campaign here, which is live until June 16, 2015 (Only 4 more days!). More information about the project is available on the crowdfunding page, and in these recent articles published in Scientific American and the Washington Post. So how did I get into this project? Well, When I was at the Australia Wildlife Zoo in Australia last September, there was a sign next to the koala exhibit with picture of a joey whose mouth was covered in a brown substance. The sign read something like “It’s not chocolate!” and explained the pap part of the koala’s biology.The moment I read this I knew there was some fascinating microbiology questions that were begging to be answered. While researching the microbiology behind this behavior, I found a study the recorded the detrimental effects antibiotics had on a koala’s eating habit and inability to maintain weight, but the question of how antibiotics were effecting the microbial composition of koala’s guts remained unsolved. That is how this whole project started. Like most people, I think koalas are cute and appreciate how iconic they are to Australia. 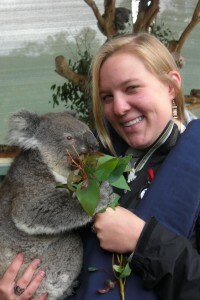 Otherwise, I’m not very attached to koalas – they are actually quite mean and antisocial! But koalas are a fantastic model system – one food source, plenty of sampling opportunities (in Australia at least), frequently given antibiotics, and clear mechanism of the transfer of microbes from mother to offspring.